1. 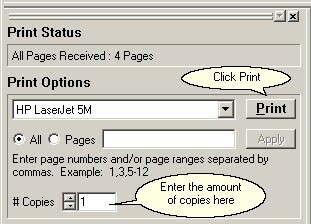 As usual, print from your application program to a ClickBook printer. 2. When ClickBook pops up, set the Num of copies option. 3. Click Print. ClickBook prints the first sides of all copies, with a single instruction sheet. 4. After the first sides of all copies have finished printing, put the whole printout stack back in the printer. 5. Click the Print Second Side button. 6. After the second sides of all copies have finished printing, separate the copies. 7. Cut, assemble, and bind each booklet individually. Note: If you want to print multiple identical booklets, follow the instructions above. Setting multiple copies within your application program will not work correctly.